Designed with sleep nutrition in mind, our popular CozyPLUS natural latex mattress delivers a wonderful sleep experience with customized comfort level that's proven to be a customer favorite. Starting with our Pure Performance 5-Zone Core as the ever-critical support foundation, we then top it off with a 3" layer of latex for a surface that gently cradles you in supportive comfort that YOU choose. The most popular configuration is Medium (not too soft and not too firm) but you can choose the firmness your prefer for each side of the mattress. On the surface: We start with our signature Body-Zone Quilting which features 100% pure wool under soft organic cotton circular stretch knit matelasse fabric. Our zoned quilting is designed to provide subtle variances to allow a little more give in the shoulders with a tighter pattern in the lumbar for more support. We specifically use a small amount of wool in our quilting so you can experience the orthopedic comfort of our latex yet still receive the wonderful benefits of wool, without having to worry about deep body impressions. Temperature regulating and moisture resistant, our wool allows moisture to wick away keeping you cool and dry in the summer and perfectly warm in the winter. Combined with our superior stretch knit certified organic cotton, our materials naturally BREATHE - just like you do - to resonate with your body and provide the best temperature regulation so you don't sleep hot. We source our fleece from New Zealand, world-renowned for their superior wool and have it combed and carded to our specifications in North Carolina. Our luxurious organic cotton fabric is featured in a stretch knit that MOVES with your body AND the latex mattress. Tightly-woven fabrics, like twill or damask, constrict the dynamic contouring flexibility of the latex mattress. Our quilting enhances the lovely latex mattress underneath, which is the winning component in our all latex mattresses. Our organic cotton matelasse is made with three layers of fibers (the top, the threads inside, and the bottom) which are knitted together in our exclusive pebble pique design. We mill our fabrics in South Carolina. Our 5-Zone Pure Performance latex mattress core is made from pure, creamy white natural latex rubber ergonomically designed to last decades and provide the support your body needs and craves. The Cozy PLUS features a 3" layer of comfort layer in your choice of Soft, Medium or firm latex above the core for contoured cushioning that still provides optimum support. This added comfort layer is ideal for side-sleepers that need buffering from the direct firmness of the core. Our zoned latex cores and toppers are made to our specifications from 100% natural rubber with no synthetics or fillers using the time-tested natural Dunlop process which has proven to out-perform anything in terms of longevity and durability. Although heavy and dense, it does not have any fillers often associated with Talalay, nor does it have any chemicals or petroleum used with synthetic latex. We work directly with our supplier located in the beautiful island of Sri Lanka, known for their high-quality rubber plantations. In fact, they were the first plantation and manufacturing plant to receive the global organic latex standard certificate. It costs a little more, but we decided to make our mattress with a two-sided quilt design. The bottom features certified organic cotton twill quilted to wool which can be flipped and used as a sleeping surface if you should ever desire firmer comfort. Our mattresses have a full zipper so you can easily remove the entire top quilting of your mattress. This is great if you ever have an accident that requires spot cleaning: Just unzip, spot clean and let air dry. It also allows you to get inside the mattress at any time and make adjustments to the components. Your CozyPure mattress will arrive fully assembled. Many zippered latex mattresses from other companies actually just ship you the pieces making you put it together, so in theory you're the final manufacturer. Latex is very heavy and cumbersome so they can be quite a challenge to assemble. In addition, there is no quality control when the latex pieces are simply pulled off a shelf and shipped to you. 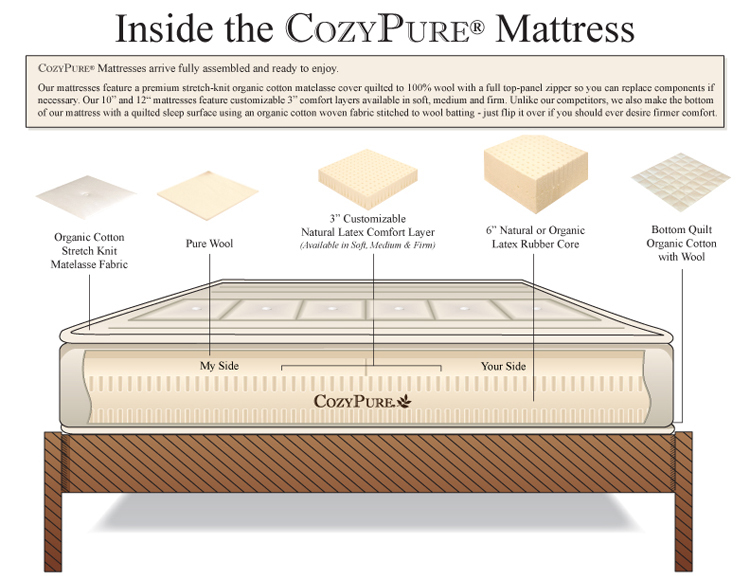 Here at CozyPure, WE MAKE THE MATTRESS and WE SEE THE LATEX while we build your mattress, we're able to spot any defects and put them aside. When you receive our mattress, simply take it out of the box, put it on your bed frame and you're ready to enjoy quality sleep. #1 - Add 1.5" soft sculpted layer (turning it into our Perfection Mattress). This provides more progressive softness. #2 - You can add second layer of 1.5" soft (total of two layers) for a tight-top feel that will offer a bit more softness. #3 - Buy a different 3" soft or firm layer (even ten years later) #4 - For folks that want plush luxury, consider adding our Natural Latex LaNoodle Cuddle Top. #4 - You can also combine the above in different configurations or interchange the layers -- call us for details. #5 - If you should ever desire the Cozy Plus to feel firmer, simply flip it over. When you purchase a CozyPure mattress you become a Cuddle-Up Club member and receive lifetime discounts of 20% off our bedding. That means you never have to wait for a sale. Want another set of sheets or some LaNoodle Pillow for gifts? Maybe try our wonderful comforter or matelasse blankets? You'll get 20% off the price. Even better, when we DO have a sale, usually our members get an additional 10% off the sale price -- sometimes up to 30 or 40 percent off the regular price. If you love organic bedding, that can add up to hundreds of dollars in savings! You'll also get exceptional treatment as a preferred customer... because we're not happy unless you're happy. ***** We have a Five-Star approval rating from Shopper Approved, a third-party review site that monitors our customers overall satisfaction rate. With over 23 years experience exclusively in the organic comfort industry, we'll share our knowledge to assist you, whether it's the first time selecting your mattress or ten years from now if you need to change the comfort. We stand behind our products and we'll always be there for you. We've been in business since 1991 offering green and organic products for living. In the year 2000 we decided to focus on the bedroom, working with USA mills, designing our own fabrics and manufacturing exclusive products. We also installed a full solar system in 2010 which generates clean energy. Our Pure Performance Mattresses are designed to go directly on a platform slat bed frame or slat foundation. Our latex mattresses can also be used on adjustable bedframes.